Judge Dismisses Murder Charges Over Boy's Death On Kansas Waterslide Caleb Schwab, 10, was decapitated in 2016, when the raft he was riding down the Verruckt waterslide went airborne and hit a metal pole. The slide was the tallest in the world when it opened in 2014. A judge has dismissed all remaining criminal charges over the death of 10-year-old Caleb Schwab, who was killed while riding the 17-story Verruckt waterslide at the Schlitterbahn Waterpark in Kansas City, Kan. 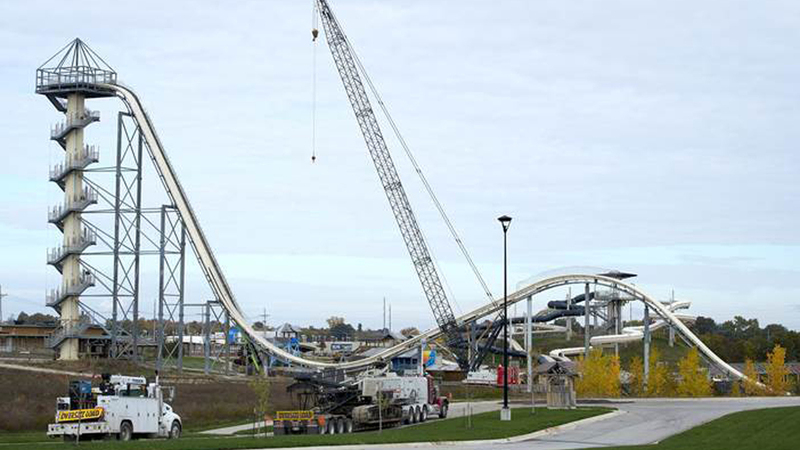 The process of tearing down the slide began last fall. The waterslide's two main designers, Schlitterbahn co-owner Jeffrey Wayne Henry and John Timothy Schooley, and a general contracting company had been facing charges ranging from reckless second-degree murder to aggravated battery. The park's director of operations, Tyler Austin Miles, and Schlitterbahn Waterparks & Resorts had been indicted on charges including involuntary manslaughter. But all of those charges were tossed out after Judge Robert P. Burns said Friday that he agreed with the defendants' attorneys, who argued that Kansas Attorney General Derek Schmidt — whose office took over the case from Wyandotte County prosecutors — had abused the grand jury and tainted the indictments by showing jurors footage from a Travel Channel TV show that hyped the ride's dangers and by calling a witness who gave questionable testimony. Burns agreed that because the video segments hadn't been intended to reflect the ride's true risks, they might have prejudiced the grand jury. As member station KCUR reports, the judge also noted that "the state's expert witness repeatedly referred to engineering standards that were not required under Kansas law at the time Verruckt was constructed; and that the same expert improperly referred to another death that occurred at a Schlitterbahn Waterpark in Texas in 2013." The Verruckt — German for "insane" — opened to the public with wide fanfare in summer 2014, less than two years after it was conceived. The indictments against Henry and Schooley alleged the pair "lacked technical expertise to design a properly functioning water slide" and used "crude trial-and-error methods" before putting the slide into operation, KCUR adds. "If we actually knew how to do this and it could be done that easily, it wouldn't be that spectacular," Schooley said according to court documents released last year. The waterslide was touted as the largest in the world, with a height of more than 168 feet. It included a steep initial drop and a secondary hump — and riders strapped into the rafts were estimated to reach a speed of around 65 mph. After Caleb's death, the park was prevented from tearing down the slide before an investigation was complete. The demolition process began last autumn. Caleb had gone to the park on a special promotional day for government officials and their families. His father, Scott Schwab, was a member of the state's House of Representatives at the time and is now Kansas' secretary of state. The Schwab family has already reached a nearly $20 million settlement with the water park that ended a civil lawsuit. The dismissal of charges is the latest setback for Schmidt's office in the high-profile case; two of the park's maintenance workers were acquitted of criminal charges last October. On Friday, the Kansas attorney general issued a statement saying, "We are obviously disappointed and respectfully disagree with the court's decision." Schmidt added that he will "review the ruling carefully" and consider whether to pursue new criminal charges — something the court said was still an option. To bring new charges, the state attorney general's office could again use a grand jury or it could simply ask a judge to rule whether there is probable cause for new charges against Schlitterbahn, its employees and anyone else involved with the Verruckt waterslide. "Since the Kansas Attorney General took over the case from the Wyandotte County District Attorney, county taxpayers have paid Schmidt's office more than $125,000 in reimbursed expenses through November," the Kansas City Star reports.